After I posted the last blog about my possession of Overdrive that is going to be installed on my Mahindra Classic. 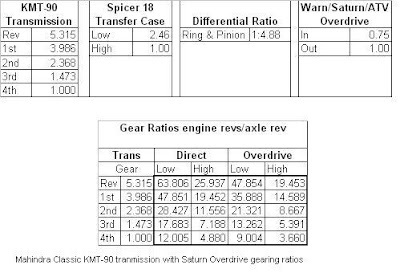 Couple of techies asked me about the gearing ratios and the figures that is going to prove the increase in speed, fuel economy and reduction in noise and engine RPM. My name is Ricardo Rasc, is of Brazil, Brasilia. I am pilot of rally sponsored by the Mahindra of Brazil. I ran in the Rally of the Sertões and was in 3º place with a Mahindra Scorpio CS. It would like information on this Jeep Mahindra, it still is manufactured? It possesss reduction? , Which the exchange and engine? Debtor. Good to see you here, Mahindra is still producing flat fender jeeps in India. However the SWB(81" wheel base) model jeeps are history now and they are no more in production.